French President Emmanuel Macron (C) presides over an emergency crisis meeting with French Prime Minister Edouard Philippe (L) and French Interior Minister Christophe Castaner (R) at the Interior Ministry in Paris, late 16 March 2019. 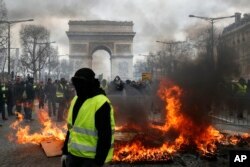 After wrapping up thousands of town hall meetings, France starts a new chapter of its "great debate," aimed to address longstanding public grievances and offer solutions to the yellow vest protest movement. The debates have also given the president and his government some breathing room — time that will last through the current "phase two," which ends in April. Citizens are being randomly selected to participate in regional meetings aimed to prioritize the myriad demands. 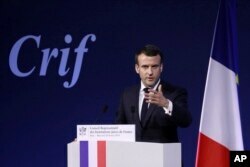 FILE - France's President Emmanuel Macron gives a speech during the 34rd annual dinner of the group CRIF, Representative Council of Jewish Institutions of France, in Paris, Feb. 20, 2019.